Wouldn’t it be nice if there was a guitar system to easily allow you to visualize and connect the guitar fretboard up and down the neck? The CAGED guitar theory system does just that. It lays out the guitar fretboard in a logical manner, allowing you to easily navigate the fretboard. The CAGED guitar theory system is built on the shapes of the C, A, G, E, and D chords, hence the term CAGED. Each of these chord forms can be played up and down the fretboard. Let’s first take a look at each of these shapes in their open forms. As always, the orange dot is the root note. Each of these chord shapes can be played as a barre chord and moved up the neck to form other chords. 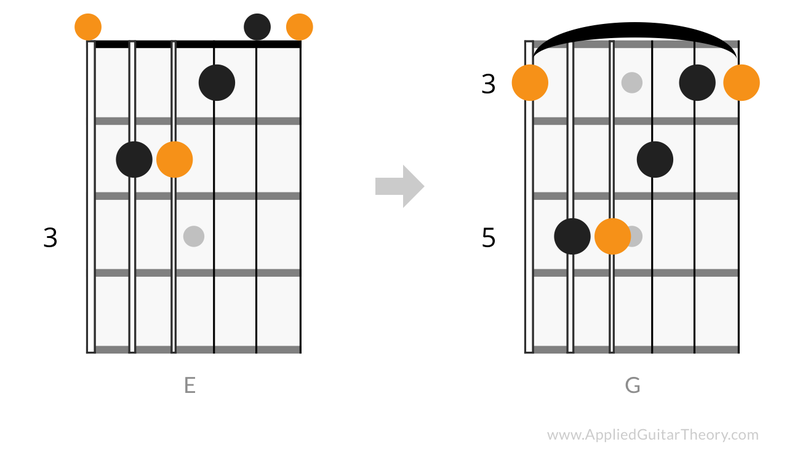 By moving the C chord shape up to the 6th fret you form a D# chord. 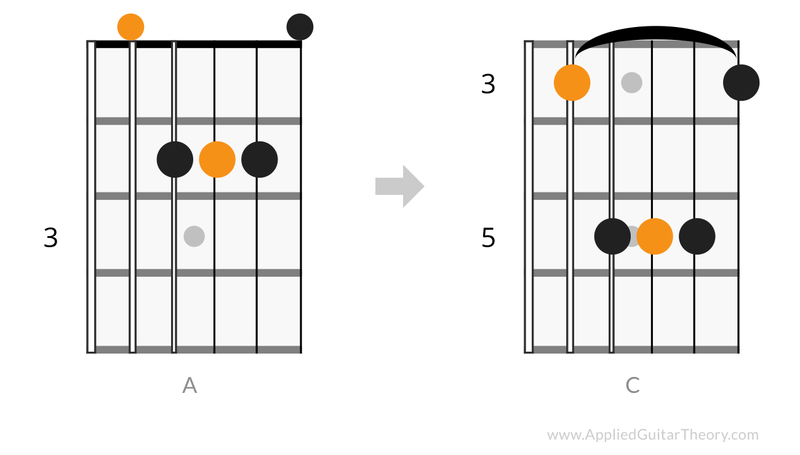 By moving the A chord shape up to the 3rd fret you form a C chord. 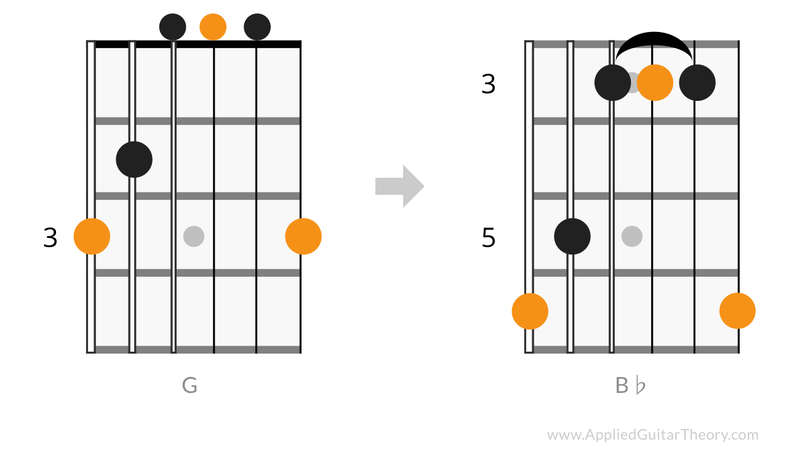 By moving the G chord shape up to the 6th fret you form a B♭ chord. By moving the E chord shape up to the 3rd fret you form a G chord. 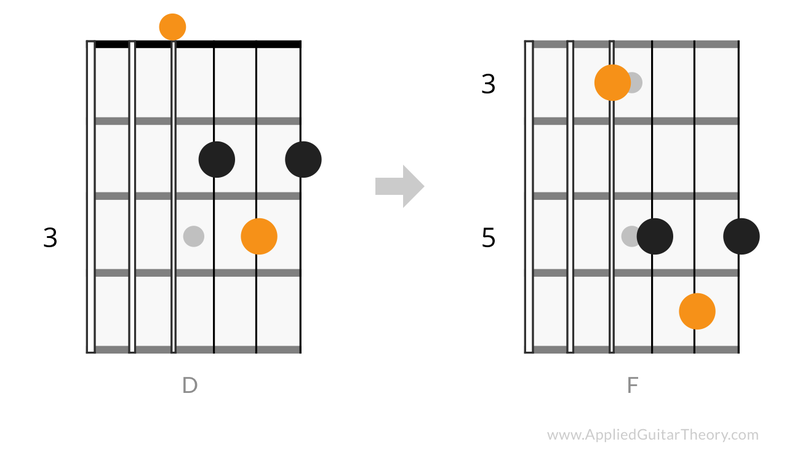 By moving the D chord shape up to the 6th fret you form an F chord. Let’s follow the C chord up the fretboard to see how it comes together. 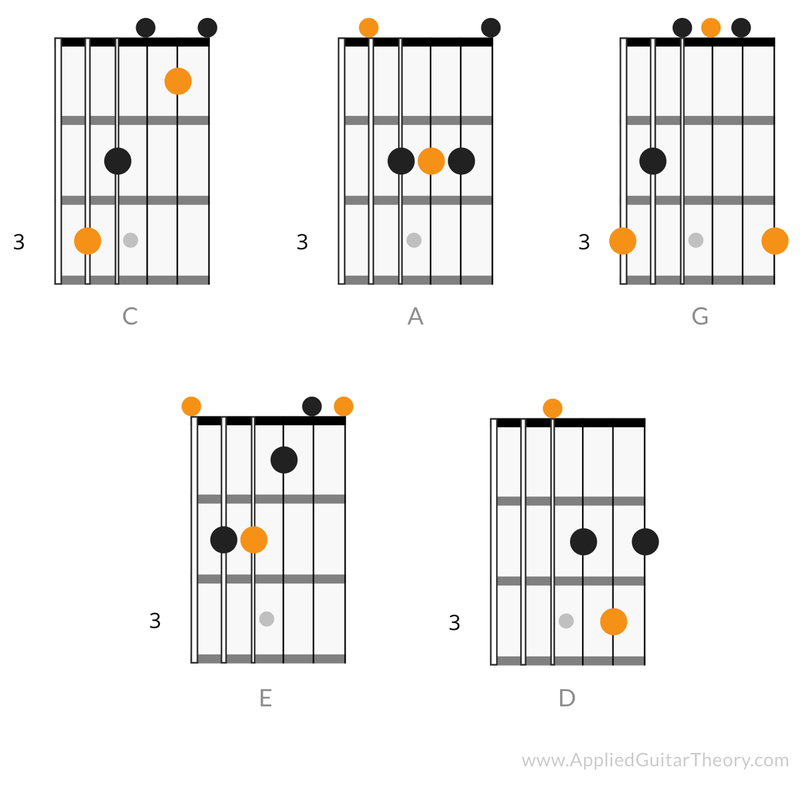 In these diagrams you can see how the CAGED chord forms are interconnected across the entire fretboard. Again, these chord forms apply to any root note. 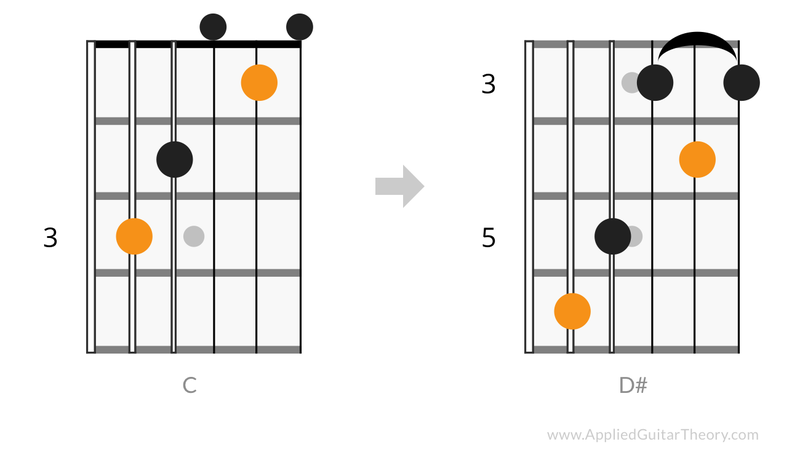 The following diagram outlines the D major chord across the fretboard using the CAGED shapes. The CAGED system doesn’t just apply to chord shapes on the guitar fretboard, but also major scale and arpeggio patterns. 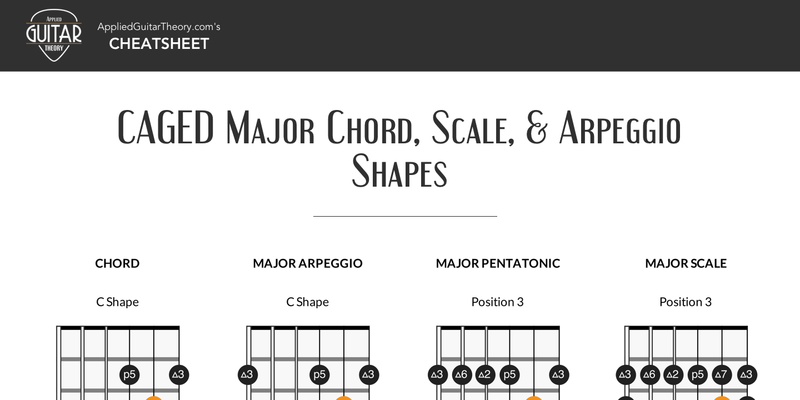 This makes sense given that chords are built from scales. 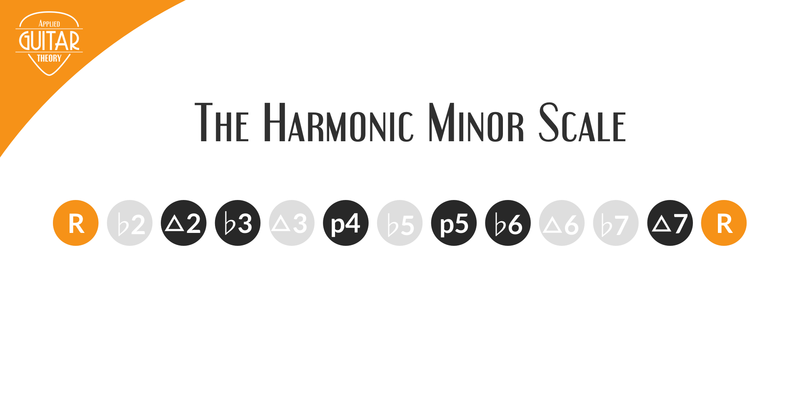 The diagram below outlines the major arpeggio and scale pattern for each of the CAGED chord shapes. One important note to the CAGED system. 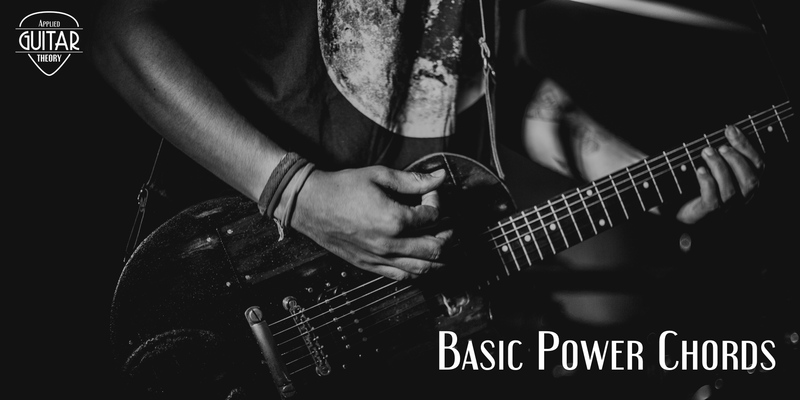 While this lesson focuses only on the major chords/scale patterns, the CAGED system also applies to minor chord shapes and scale patterns. I’ll do another post on the minor CAGED system in the future, but if you learn the major version, going to the minor should be rather easy. The CAGED system is a useful system that lays out the guitar fretboard in a useful way. 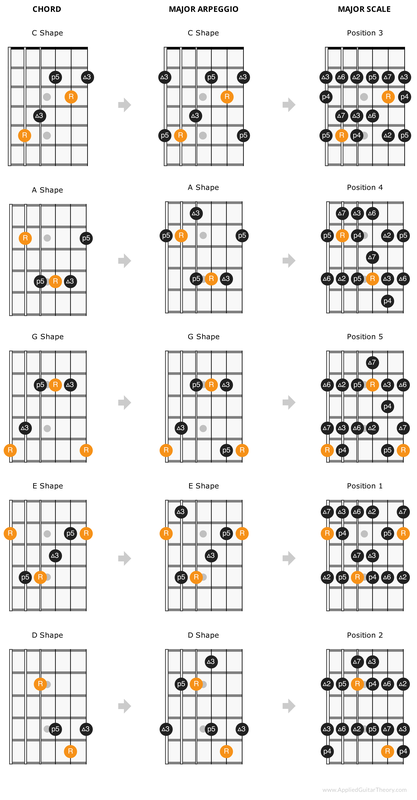 By learning the CAGED system, you can easily visualize the entire fretboard and play in any position on the neck using familiar chord shapes and scale patterns.